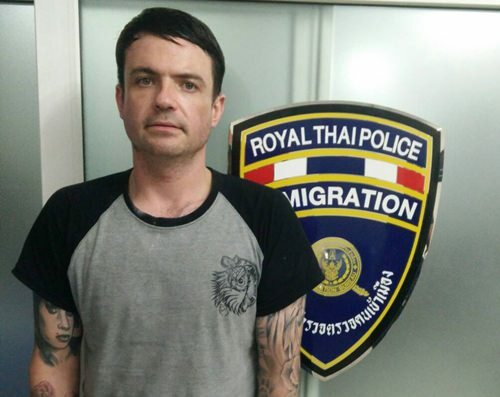 A British man has been blacklisted from Thailand after he was found overstaying his visa by 106 days. Chonburi Immigration officers stopped Matthew Joseph Love, 32, on Walking Street after they witnessed him behaving oddly. Matthew Joseph Love, deported for a lengthy overstay, will perhaps make it back in time to vote in the Brexit referendum. A check of his passport found he had overstayed his 30-day visa-exemption stamp by 106 days. He was arrested and processed for deportation and will be blacklisted from the kingdom for five years under regulations that went into effect in March. Under the new system, penalties vary depending on whether the overstaying foreigner voluntarily turns himself in or is arrested. For those whose overstay is found upon arrest, the bans begin at five years for up to a year of overstay. Those here longer will be blacklisted for 10 years.